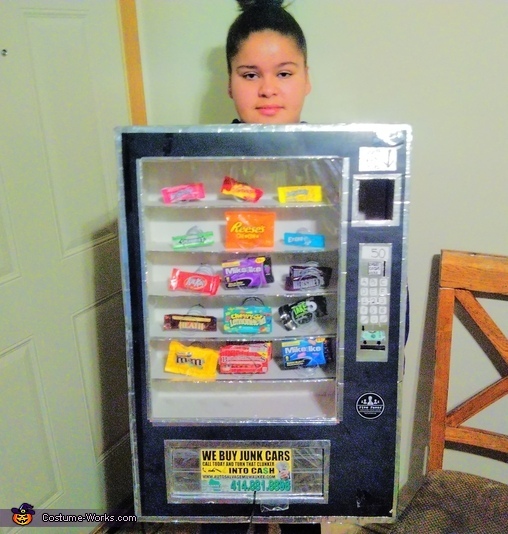 Cece's first idea was a soda machine it did not take long to find a candy machine more fitting. It holds her candy from trick or treating inside the costume. In picture 4 # Cece is pointing at the candy deposit. The collected candy comes out where you would get your candy out as seen in picture #5. Coins put in the coin slot end up with the deposited candy. There are two switches scene in photo #6. One is to turn all the lights on and off. The other is to flash only the candy deposit light because people were saying "where do I put the candy?" The lights are LED dome lights from a car. Powered by rechargable flashlight batteries that last hours and hours. Cece fell on the last stair at school with minor damage. We changed the shape or the candy compartment on the inside to make stairs easier. So we had to make it strong and light and cheap and safe there's a fuse on the lights. All the parts for the lights were free leftovers from Dad's tool box. We bought lots of tape poster board and plastic for the window. It cost under 40$ not counting the candy. It took over 50 hours to build. Cece and Dad built it. No blood was involved during construction. It held up great to trick or treating. And will be out next year. It can hold more candy then you want to hold, it can get a little too heavy when the trick or treat gets going good. Thanks for checking it out. It was lots of fun to build. Awesome costume, hope you win!